Prof. Roger Homan considers how the Pre-Raphaelite model Jane Burden changed our collective mental image of the appearance of angels. Jane Burden was the daughter of an ostler. When she was eighteen she went with her sister to the theatre and sat behind the Pre-Raphaelite painters Dante Gabriel Rossetti and Edward Burne-Jones. Rossetti was always on the lookout for a suitable model and on that occasion the two men had eyes only in the backs of their heads. They classified the sisters as "stunners" and introduced Jane to the erstwhile influential decorative artist and socialist ideologue William Morris. He "raved" about her. She modelled for a number of the Pre-Raphaelite coterie and two years later, in 1859, she and Morris were married. In making such a union Morris confounded social convention: she came from a poor village family and he from the prosperous merchant class. It appears that William's parents did not attend the wedding. At the same time he confronts fashionable notions of beauty: this girl, whom some mocked for her gypsy looks, was not at all what was appreciated among those of discerning taste, let alone the stereotypic angel that she was to become. Her distinctive features, the abundant dark hair, the long neck, the large and open eyes, the well-formed lips, the straight nose became instantly recognizable. Whether she appears for Rossetti as The Blessed Damozel (1871-79, Lady Lever Gallery) and Astarte Syriaca (1875-79, City Art Gallery, Manchester) or for Morris as Queen Guinevere (1858, Tate) or for Burne-Jones in The Beguiling of Merlin (1874, Lady Lever Gallery), the narrative context is subordinate to the portraiture. The paintings of Rossetti's later years, when Jane and William had fallen apart, are palpable expressions of the artist's obsessive love for her: they are rather more about the model than the subject. In more recent times she would have been thought of at least a super-model and, possibly, a "celeb". In her own time it was not so much in fashionable magazines as in stained glass windows that she was to be found. I cannot paint you but I love you. feeling that he could not give it that celestial divinity which it demanded. Doubtless one who loved Jane Burden less – or who did not apprehend the spirit within her - would have been more easily satisfied. Notwithstanding the sense of inadequacy that Morris suffered in his own attempts with the brush, the face of Jane Burden was to be immortalized. It appears as the eponymous queen of the lower world in Rossetti's famous Proserpine (1873-77, City Museum and Art Gallery, Birmingham). It is the standard of beauty in Pre-Raphaelite art: when people talk of "a Pre-Raphaelite face", they are referring – whether they know it or not - to Jane Burden. Her features were rendered androgynous as the prototype angel in English religious art of the late Victorian period. Through the work of Edward Burne-Jones it appeared in numerous stained-glass windows, notably those in Christ Church at Oxford. Consequently she may now be identified on many a Christmas card. One of the axioms of the Pre-Raphaelite tradition was to paint from life but this implied a rejection of idealized form. That her features are so recognizable raises a number of questions. The words that Morris scrawled on his canvas express the agony of the artist of the sacred. The face of his model and wife was to become the angel of English religious art and it is the point at which, in his own judgement, he cannot paint. Nor does he go on to establish himself as a painter but as an intellectual and as a craftsman. Does it matter that we recognize her? Is it not the job of an actress to lose herself in the character she plays? To both questions the academicians of the mid-nineteenth century would have given affirmative answers but the PRB took a different view. Before Jane Burden, there were very few brunettes in the celestial sphere. They mostly had golden waves of hair that rose in the breeze to give the sense of flight, an effect beautifully produced for the angels in the roof of Blythburgh church in Suffolk who famously survive the bullets of Cromwell's iconoclasts. The face of the conventional Gabriel of Fra Angelico is subordinate to the body language, the halo, the wings and, above all, to the Annunciate Virgin. 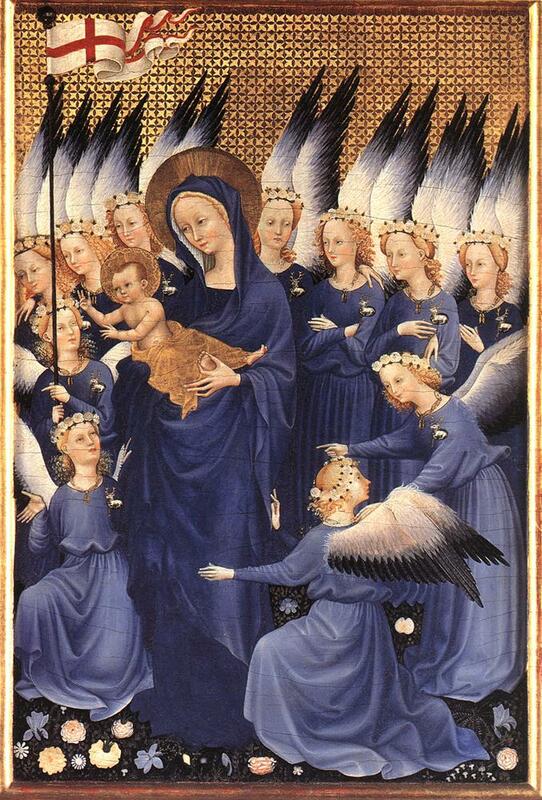 When angels gather as hosts on the Wilton Diptych (c. 1395, in the National Gallery) they are presented as fair haired and uniform. The medieval world was accustomed to idealized types and not ready for a striking character like Jane Burden. Jane Burden look-alikes would of course be out of place in some companies of angels. Those attending the Christchild at close range tend themselves to be infants: so they are in Lippi's Madonna and Child with Angels (1460-65, Uffizi). Nor do we find the Jane Burden model in a horizontal posture, as we do when they fly in Giotto's heavens. However, for Burne-Jones she sits well as an angelic minstrel, playing the harp in the east window of the church of Lyndhurst or the flageolet in an image in the Bridgeman Art Library. The issue is whether so distinctive a human beauty assists or impedes our connection with the heavenly realm. In Rossetti's painting she is always evident as Jane Burden. For Burne-Jones, however, Jane Burden becomes a type: her image appears in The Golden Stairs (1876-80, Tate) not as an individual study but several times within a host. He borrows her image so often and uses it in such moderation that we have now become accustomed to a new generation of angels. Roger Homan is Professor of Religious Studies at the University of Brighton and author of The Art of the Sublime: Principles of Christian Art & Architecture, (Ashgate, 2006). Nicely written and well presented. Rossetti's representations of Jane Burden fulfill every criteria for a heavenly beauty, but it is Morris's Guinivere that beguils. The pain that breathes from the inability to move from the craftsmanlike depiction to the fantasy of Rosetti is palpable. That's not Mrs. Morris in Burne-Jones's painting. That's Burne-Jones's own personal muse and obsession, Mary Zambaco. That's another sad and complex story.